Walking down the picturesque streets of Noank, Connecticut is an inimitable experience. Somewhere between leaving Groton and parking opposite the village shipyard, you seem to have stepped back in time. In Noank village, turn-of-the-twentieth century timber-frame houses line chocolate-box streets. The ever-present sound of the waves crashing and the sweeping sea views remind you that this is a working seaside community, still firmly routed in the New England fishing, lobster and shipbuilding industries. Noank’s beautifully preserved historic buildings, matchless ambiance and proximity to nearby historic Mystic have always attracted visitors, many of whom remain so charmed they decide to stay. Recently, visitors to Noank have also been enticed by some of the best food in South Eastern Connecticut. The village’s selection of small but exceptional restaurants has consolidated Noank’s reputation as a good food hub. If there’s one Noank resident to whom this comes as no surprise, it’s 25-year-old Andrew Blacker. Andrew, a recent graduate of the University of Connecticut and lifelong resident of Noank, is the storekeeper, manager and chef at Noank village’s most iconic business: Carson’s Store. Carson’s epitomises all that makes Noank unique: a café-come-meeting-place-come-historical-landmark dating from 1907, famous for delicious brunch and wondrous ice cream, a fascinating history, an iconic nineteenth century building and a bona fide all-American diner interior. 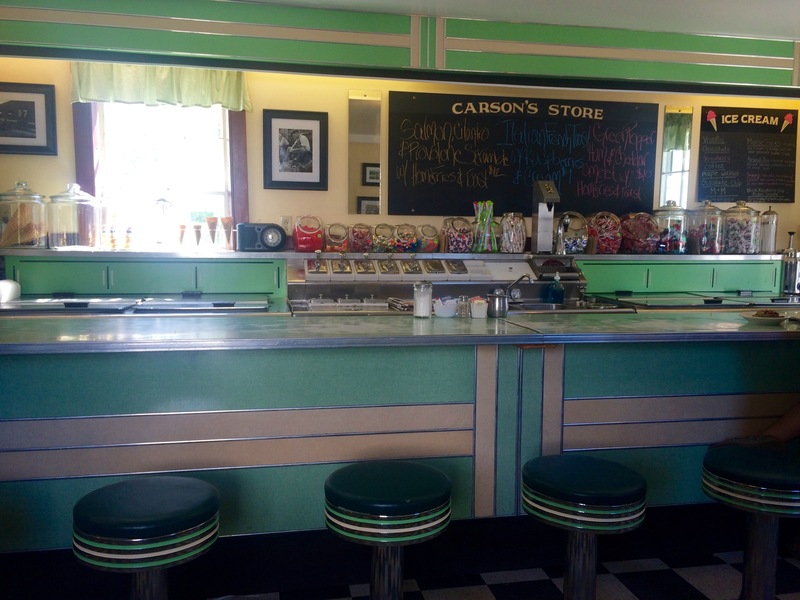 For Noank residents and visitors alike, Carson’s is a beloved institution. As the store’s newest manager, Andrew is the man tasked with steering the store into the twenty-first century, whilst still retaining Carson’s unique charm. To me, a Brit abroad, Carson’s seems to perfectly characterise old-time Americana. Every time I enter the store I feel as though I’ve walked onto the set of my favourite twentieth century American movie. The store has a timelessness and friendliness that cannot be matched. Diner-style restaurants may be all the range nowadays, but Carson’s is the real deal. This summer, I was presented with the opportunity to interview Andrew and I immediately jumped at the chance. My visit to the Mystic region in Summer 2014 had been darkened by the news that Carson’s had closed its doors, but after remaining close for just under a year, the store reopened last December, newly rejuvenated and with Andrew and his team at the helm. Noank residents and visitors rejoiced at the news, although many remained uncertain of the exact behind-the-scenes goings on which had lead to the store’s closure and its happy reopening. In our August interview, Andrew is happy to set the record straight and pleased to hear of the widespread delight that reverberated around the Mystic region following the announcement that Carson’s had reopened. In late 2013, Andrew’s father David decided to retire. Andrew was keen to take over, but was in the middle of his final year studying at UCONN. During his time at college, Andrew worked in restaurants, sales and marketing, establishing an impressive resume and a wealth of useful experience. Andrew’s efforts paid off. He worked hard in the fall semester to ensure he could complete his course in December, rather than May. ‘I was able to do it and finished my bachelors in science from the college of Agriculture,’ Andrew tells me proudly. Only a week after his graduation, Carson’s Store was up and running once more. Whilst at UCONN, Andrew specialised in Natural Resource Economics and gained two HACCP (hazard analysis and critical control point management) certificates. These are licenses that are required by the USDA to process or resell seafood and meats. Carson’s history is an undeniable part of the store’s appeal, inextricably linked to and still impacting on its present day existence. Despite the importance of this history, I don’t think I’ve ever heard the full story of Carson’s origins. I am keen to hear more about this history and I ask Andrew to tell me more. He explains that Carson’s actually had two other locations prior settling in its current home. Interestingly, the structure that was to become the iconic Carson’s building we know today was originally a summer kitchen for the house next door. ‘The house was built in the 1840s,’ Andrew explains, ‘During that era, people would do their summer cooking in a summer kitchen, which was like an open air structure, to reduce some of the heat from the open fire. Since this move, Carson’s store has remained in the same spot for over one hundred years. Andrew’s father David made some significant, important changes to Carson’s. Carson’s continued to operate as a general store until the 1990s, when it began to serve breakfast, becoming the brunch hotspot Noankers know it as today. The store underwent another renovation in 1995 and the kitchen was added and opened in 2000. ‘We take briskets, season them, slow cook the meat for 12 hours at just over 200 degrees until it literally falls apart. We then chop it, mix it with seasoned potatoes and grill it to a crisp. Since Carson’s reopening in December 2014, the store has added a new wing to its bow. Taking advantage of Noank’s nautical setting and its proximity to gorgeous fresh sea food, Carson’s began offering a new raw bar menu in the evenings. ‘The raw bar menu menu features local Noank Oysters harvested just a few hundred feet from the restaurant, as well as wild caught Rhode Island littlenecks,’ Andrew tells me, ‘As I mentioned earlier I worked for the Aeros Cultured Oyster Company. They are one of the members of the Noank Aquaculture Coop. When I worked there I realised that many people didn’t know there was an oyster farm in Noank. When they found out they wanted to buy oysters. The problem was the Coop only sells the oysters to wholesalers. It is clear that Andrew has big plans for the store. His ideas are often new and exciting, but remain perfectly suited to the mission, integrity and culture of Carson’s. ‘The town and the community have been so supportive since we reopened and where we are located is truly one of our greatest blessings,’ Andrew says gratefully, ‘Mystic is also becoming such an attraction, so that proximity has definitely helped. At the same time there is nowhere in the world like the village of Noank. The small town feel is something you can’t recreate.’ Here’s hoping Carson’s will remain a part of Noank’s distinctive, unique vibe for many years to come. What a great article. I hope I can get others to read this, I will share..